Masayang ni-welcome ni Kim Chiu si Xian Lim sa Cherry MoBile Family. Ito ay naganap kahapon December 6. Sa Instagram ng actress ay nagpost siya ng photo nila ng actor with Cherry MoBile personnel. Si Xian ay dating endorser ng CloudFone Mobile. Samantala, masaya ang KIMXI fans dahil pagsasama nila kagabi. Ibinahagi nila ang kanilang nararamdaman sa comments portion ng Instagram. Naging trending topic pa ito kagabi sa Twitter. New photo by chinitaprincess on Instagram. Posted on December 6, 2016. 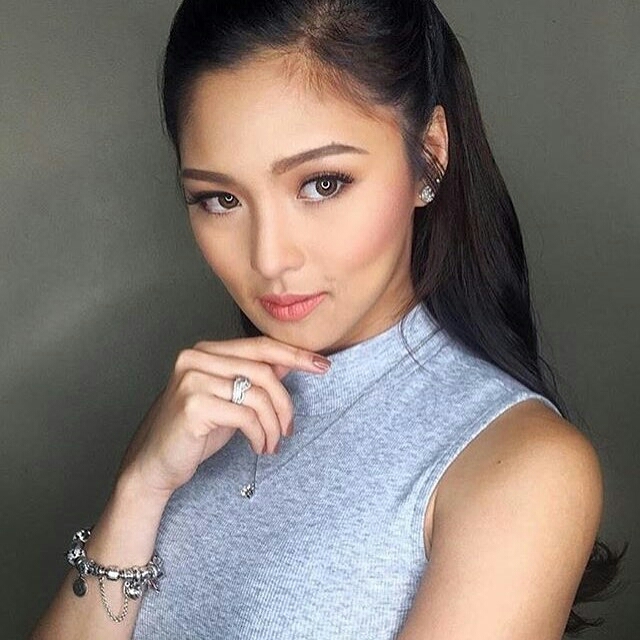 The actress Kim Chiu posted a throwback photo on her Instagram account. Her followers reacted on it. New photo by chinitaprincess on Instagram. Posted on November 14, 2016. Xian Lim Approves of Kim Chiu -Gerald Anderson Reunion? Video courtesy of Chikkaness. During the press con of the reunion teleserye of Kimerald, Kim Chiu appealed to fans to support her and Xian in their individual projects. Pressed for her message to KimXi fans, the Universal Star revealed she and Xi talked about the teleserye and mentioned “malawak ang pagkakaintindihan naming dalawa”. Obviously the reunion with Gerald was brought up and Xian Lim has prior knowledge of it before the press con. 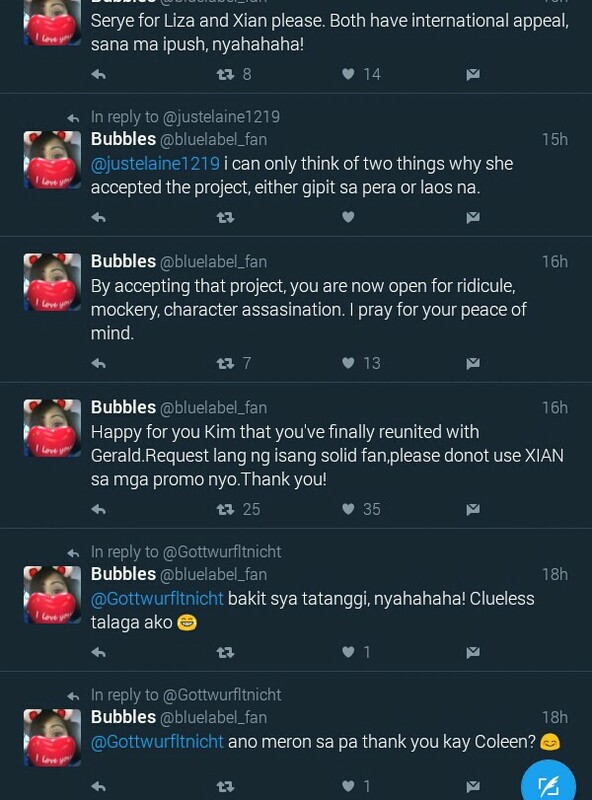 Not that the fate of the teleserye lies in the hands of Xian, but the fact that Kim talked to him means that his viewpoint matters. And Xi being mature and professional understands this is part of their craft. 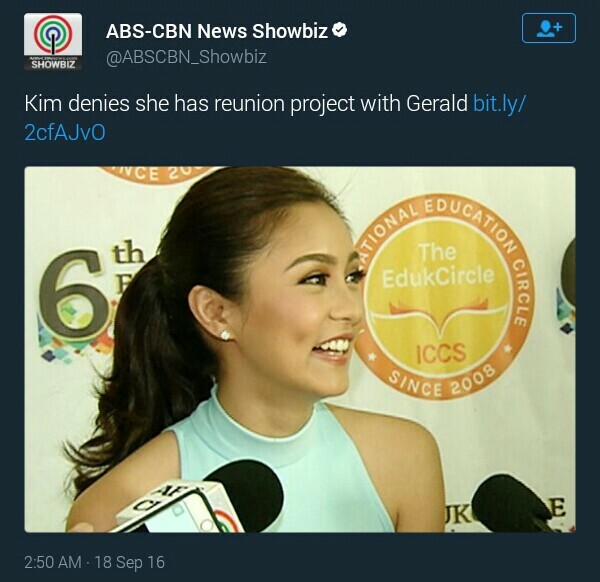 “Wala po kaming issue” explains Kim about Xian’s reaction on the Kimerald reunion. “Hiniling namin na suportahan nila kami individually”. Kim Chiu reiterates they have a deep understanding with Xian Lim and that she is happy with him. Kim also recognizes that the achievements they gained in the love team is something they owe to the KimXi fans. It is pouring emotions now on Twitter from all camps, following the announcement of a teleserye starring ex couple Kim Chiu and Gerald Anderson. 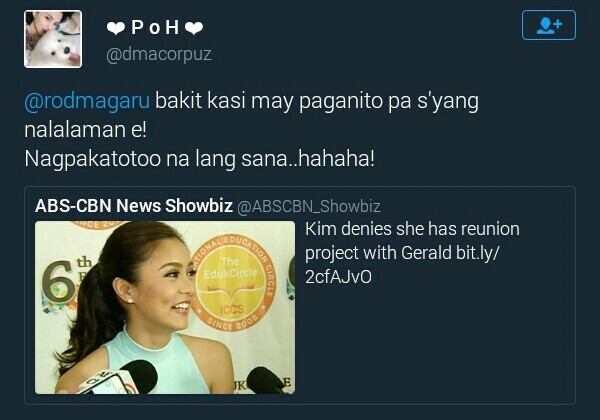 Last month Kim denied there is a brewing project for her and Gerald. 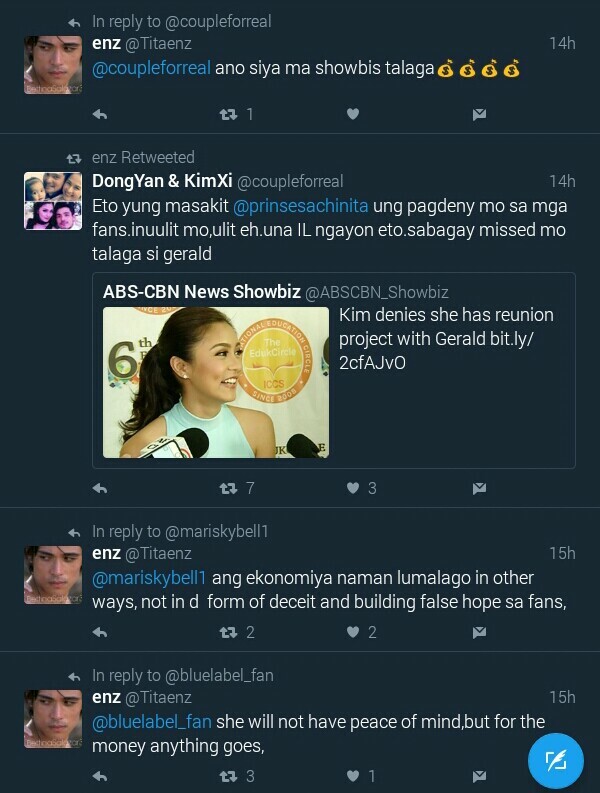 This caused a backlash now from fans of Kim and Xian love team. Although there is a separate project for Xian Lim and Coleen Garcia, fans feel betrayed. A few solid Kim Chiu fans were also stunned by the news, but chose to understand her and commend her bravery for accepting the project despite the unavoidable onslaught of bashing. 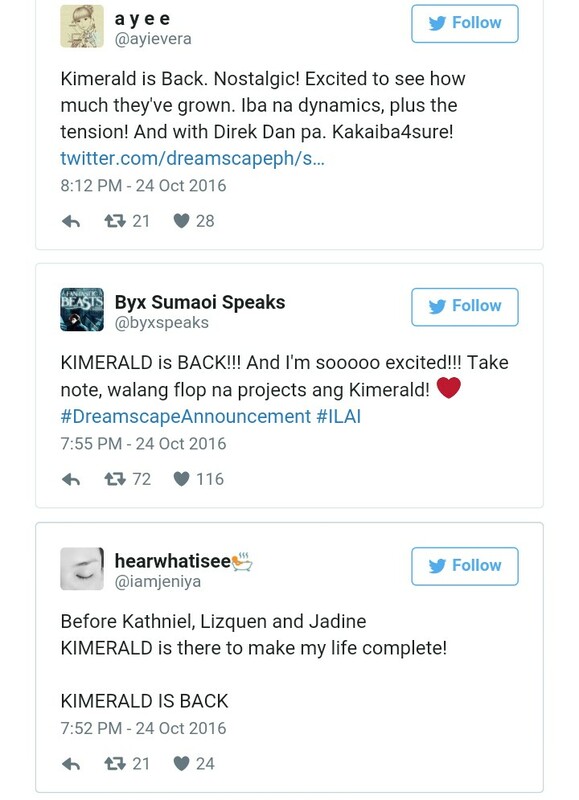 Meanwhile, the Kimerald camp hails the project as the ultimate comeback for the BB born love team. Situations like this are not new in Philippine showbiz. But there is no denying however this KG TS announcement is causing quite a stir. Emotions are still fragile, but once the dusts settle down, fans will become more mature, some go, others stay, in the end, the only ones left standing will be the artists. They will be judged for their loyalty and dedication to their craft. The following are few of the banters against the TS. This is probably very difficult for Kim Chiu, no amount of explanation will appease emotional fans now. But if we take this to other side and do some critical thinking, if Xian Lim was in her place, what would he do? Or what advice would he give to Kim? As a big fan, we all know Xi is passionate about his craft, as an artist there nothing more fulfilling than to be able to elevate and grow in your chosen field. We all aim positively for the betterment of the chosen craft of our idols. Apparently, things went for a sudden detour between the denial and the pronouncement. The decision is a product of so many factors. These actors we adore are employees of a company, they answer to those who employ them. Following or no following, their careers are dependent on the internal politics of showbizness. Can they say no? Of course yes. But only if they choose in favor of their craft. Because again at the end of the day, they will be judged for their loyalty and dedication to their craft. Vote Like or Dislike above! personally it’s a super duper like. From @kimchiulovee – Kimmmy! My heart is crying for you. I know this is gonna be hard, you have to be so professional because you will be working with an ex-lover, in which case you were actually broken – almost beyond repair but still you were able to find a man who was able to break the walls you surrounded yourself. There will be a lot of issues regarding this series, nevertheless, I just want to tell you HOW PROUD I AM OF YOU! Thank you for being so brave. You may receive a lot of comments – both good and bad – but always remember, true KIMSTERS at heart will have your back. I love you forever, Kimberly! Thank you for giving this project a chance. I’ve seen all the photos and I can still see the sadness in your eyes. Anyway, I know you will rock this. From @starstyleph – What a stunner! #KimChiu in Val Taguba. As for me, two words : effortless and exquisite! Hey there Globies! Vote this photo clicking like or Dislike above. And sound off in the comments section below user thoughts on KimXi’s glam and get up. Ito ang caption ni Kim Chiu sa photo na sini-share niya sa kanyang Instagram account kung saan ay sinorpresa siya ni Xian Lim kaninang tanghali. The actor asked her to be his date for the coming Star Magic Ball 2016. Sabi pa ni Kim sa kanyang ibang post “he never fails to surprise! thank you!! ! #starmagicball2016”. Dahil dito, kinilig at masaya ang mga KIMXI fans sa sobrang sweet ni Xian sa kanyang rumoured girlfriend. New photo by chinitaprincess on Instagram. Posted on October 21, 2016. 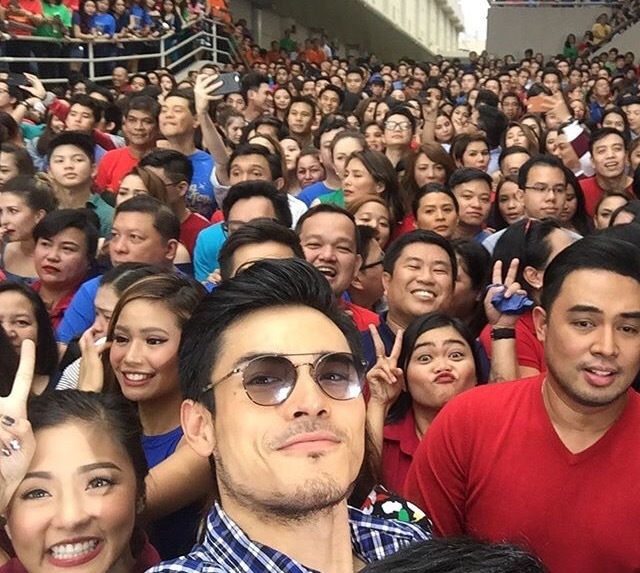 In what is apparently a shoot for a Kapamilya Christmas Station ID, Kim and Xian cheered up the crowd as they selfie together. It is without a doubt these two are now among the contemporary pillars of ABS-CBN’s entertainment realm. Kim, being the biggest and phenomenally successful reality champion. Xian, breaking the molds of matinee idol traditions. We can’t wait to see a special pedestal these two will occupy in the Holiday station campaign. But their mere presence is already enough, enough shine though to stand out amongst a crowd of stellar mass. Kim and Xi, you own our universe. But let me hear what your expectations are for this year’s ABS-CBN Christmas station ID? Rate how many stars you’ll give for Xian’s photo above, click like or dislike below and post your comments in the Disqus section at the bottom. Love to hear from you soon guys! Kim Chiu is seen in one of these clips just enjoying this ride in Coney Island in New York. The Chinita Princess is known for her being adventurous and fans seeing this clip admire her even more. Which we notice as a sign that Kim Chiu will last in the showbiz industry. It takes guts, courage and toughness of spirit to survive such a crazy world of entertainment. I mean look at Kim Chiu, she’s been through a lot in her showbiz career and yet she is still standing strong. Parang ride lang yan sa isang carnival. Either you fear it or enjoy the ups and downs. Kim Chiu has courage and she has no fear in trying in new things. And another reason we believe she’s going to outlast others, well it’s her being friendly. Look at that clip, instead of being with Kapamilya peers, she’s there meeting new friends. And that’s gonna keep her hold in the industry. Pakikisama. You’re one of a kind Kimmy.